FIREwave is a Hybrid Wireless based family of products which is fully integrated into Hochiki’s renowned ESP intelligent hardwired system. This seamless integration provides the user with maximum flexibility in configuring the system to meet the specific needs of the building into which is is to be deployed. FIREwave employs the latest technology, providing a simple and economic hybrid wireless fire detection system installation with minimal disruption to the fabric of the building and its operation. Flexible and versatile, FIREwave is suited to a wide range of applications, matching the requirements of any building from busy hotels to sensitive heritage buildings. FIREwave is the most flexible hybrid wireless fire detection solution available that is simple to install and maintain, overcoming installation and maintenance challenges on the most demanding sites; advanced patented technology is used to achieve optimum performance. FIREwave sensors are supplied in three variants: Optical, Thermal and Multi Criteria, which cover a wide range of applications. The Optical and Multi Criteria detectors feature double dust traps and adaptive signal processing to prevent false alarms. Thermal detectors can respond to a fixed temperature threshold, or detect a rate of rise in temperature. 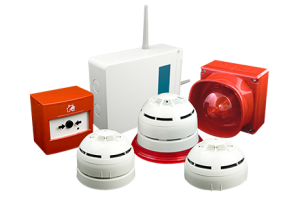 The range of FIREwave devices provides a visually attractive wireless fire detection solution, encompassing a wide variety of installation types and sizes. Wall and base mounted audio and audio-visual devices have adjustable volume levels and multiple tone settings, and are available as stand-alone Sounders and Beacons, or as combined units. Wall mounted units can be supplied in red or white, and weatherproof options are also available. Once installed, the design of our products ensures simple on-site maintenance. The lifespan of these products can be maximised using Hochiki’s Maintenance and Service facility, where products returned are dismantled, cleaned and re-calibrated to effect continued operation for many years. In addition, Hochiki’s dedicated team of technicians provides support to customers, and ensures that installation and maintenance processes remain transparent, effortless and focused on customers’ requirements.